My guest today, on the Steve Jobs inspired Join Up Dots free podcast interview is a man who shows brilliantly that in life you are never too old to start building your dream. He is a airline pilot, sailor, adventurer, and an author and an avid listener of Join Up Dots. And that my friends is the golden ticket to getting on the show, to highlight your own story to the world. 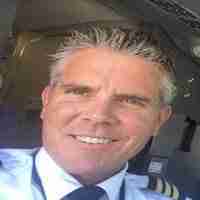 I used the power of my subconscious mind to manifest a career as an airline pilot at age 49. Since then, I have written three books and know I will become a successful author and ‘in demand’ speaker, using the techniques taught by Joseph Murphy, Napoleon Hill, Wayne Dyer, Tony Robbins, Louise Hay, Esther Hicks, Jack Canfield, Richard Bach, and many others. So is this a man who is all woo woo and sits crossed legged and hums to himself for twelve hours a day? Not not of course, although the Law of Attraction for many has a bad reputation this is a man who made conscious decisions, changed his out look and got what he wanted in life by doing the right things everyday. And isn’t that what we talk about on Join Up Dots? And so our guest went from miserable and broke, living paycheck to paycheck while working a variety of unfulfilling jobs to financially comfortable and happy. Living on a golf course in Southern California, with views to the Pacific Ocean, with his wife and two cats. So is this something that anyone can do, or does it need a team of mentors, support and years of training? And where do people go wrong, is it the personal belief, or trying something that others dont quite understand? Well lets find out as we bring onto the show to start joining up dots with the one and only Mr. Robert Lawrence. How we have so many opportunities in life nowadays due to the internet that its untrue. Log on, look around and see what the world is doing – could you do the same? Why focus and visualization in our lives is so important – If we dont know where we are heading then how can we possibly arrive where we want? Robert shares how he has managed to create a life that is totally under his control. Time is so valuable if you can learn that you are the master of time. Why it is so important to get our of your own head, embrace looking stupid and shout out to the world “That ain’t too bad really……what more can you throw at me”. Once we embrace the feeling that life is what we make it, good feelings and bad then we are on our way.